This tutorial focuses on large SNP data sets such as those obtained from genotyping-by-sequencing (GBS) for population genetic analysis in R. GBS is one of several techniques used to genotype populations using high throughput sequencing (HTS). In GBS, the genome is reduced in representation by using restriction enzymes, and then sequencing these products using HTS. For more information on these techniques we recommend reading Baird et al. (2008), Rowe, Renaut & Guggisberg (2011), or Poland et al. (2012). A minimum DP of 5x. Variants in the top 5% of the DP distribution were removed. Only variants with a MQ greater than 40 were retained. Variants with more than 60% missing data were removed. In addition to the VCF data, we have included the file population_data.gbs.txt, a tab-delimited text file that includes the name of the sample, country of origin, and the population from where it was sampled. The file is available for download at: population_data.gbs.txt. This link will likely open the data in a browser. Save the data onto your hard-drive as an ASCII text file with the same name. Make sure you are in the right folder with the downloaded files available. Some of these packages will print a message when they are loaded. Here we suppressed this information. When you load these packages, you may see more output than presented here. Remember, the first column for the vcfR object’s GT slot is a FORMAT column, hence we removed it from the name comparison step (i.e., by removing the first element in the column names vector, the FORMAT column name). If we keep the FORMAT column name we will not be able to compare between the names of the samples in the vcfR object. All of the 94 samples in the population data frame loaded in the vcfR object are in the same order. ## Warning in vcfR2genlight(rubi.VCF): Found 7 loci with more than two alleles. ## Objects of class genlight only support loci with two alleles. ## 7 loci will be omitted from the genlight object. A warning is shown while transforming the object, telling us that there are seven loci with more than two alleles. Many of the functions we will be using in these tutorials have been written under the assumption of a bi-allelic model. This bi-allelic model restricts all loci to only two alleles in order to simplify some calculations. The genlight object supports only loci with no more than two alleles. The vcfR2genlight function subsets the data to filter loci that are not bi-allelic, returning an object that contains only loci with two alleles. The warning is to make sure we are aware that this action has taken place. Additionally, we are required to specify the ploidy of the organism in order to calculate some population genetic metrics. P. rubi is a diploid organism, so we will specify a ploidy of two. All genlight objects have ploidy slots, in which the user can specify the ploidy of each individual sample, or once for the entire population. We can assume that every sample of P. rubi is diploid and we will specify a ploidy of 2 for the entire population. Note that while a genlight object can support individuals of different ploidy, within each individual all loci must be of the same ploidy. Next, let’s get started with our first analyses. Let’s create a pairwise genetic distance matrix for individuals or populations (i.e., groups of individuals). Note, that we have not specified what the variable x is. We can find documentation for this function with ?dist. There are also functions to create distance matrices from genlight objects that exist in other packages. The function bitwise.dist() in the package poppr is an example. We can find documentation for this function with ?poppr::bitwise.dist. Again, you need to know where to look for this information or you may not find it. We can use this function as follows. Note, that the variable x has not yet been specified. Lastly, because you can use as.matrix() on your genlight object, and most distance algorithms can use this matrix as input, you can use this as an intermediate step to create a matrix from your genlight object and pass it to your distance algorithm of choice. Options include ade4, vegdist() in vegan, or daisy() in cluster. Note that it is up to you to determine which distance metric is best for your particular analysis. A number of options therefore exist for creating distance matrices from genlight objects. 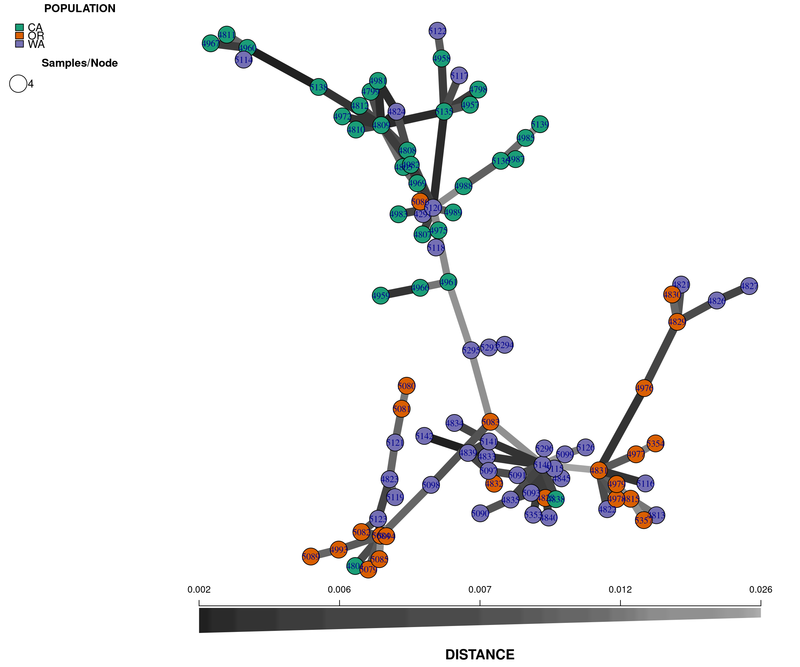 Let’s start our analysis by building a genetic distance tree that represents the genetic relatedness of the samples. The similarity between samples and groups of samples is represented by the branch length. In most trees, the branch length is represented by the number of substitutions per site for a cluster or a sample. When samples are very similar, they are grouped by short branches. The longer the branch, the higher the number of substitutions and the higher the genetic distance is between samples or clusters. 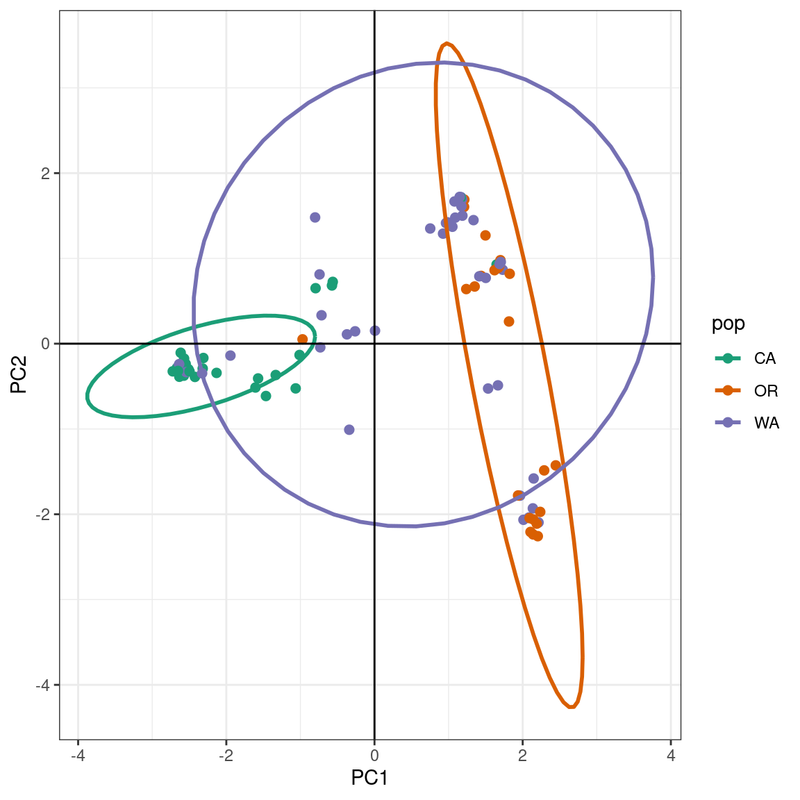 We observe that samples do not cluster exclusively by region (e.g., CA, OR and WA). Instead, we observe a cluster with mainly CA samples (Green), but also containing a few WA (purple) and two OR (red) samples. The second, lower cluster contains predominantly samples for OR (red) and WA (purple). Another useful independent analysis to visualize population structure is a minimum spanning network (MSN). MSN clusters multilocus genotypes (MLG) by genetic distances between them. Each MLG is a node, and the genetic distance is represented by the edges. In high throughput sequencing studies, where marker density is high, each sample typically consists of a unique genotype. QUESTION: Do we show a reticulated MSN? OR a MST? The nodes will be connected by the minimum distance between samples. This allows for reticulations (e.g., a network connecting nodes with identical genetic distances; contrast this with a tree where pairwise nodes are only connected to one other node with the shortest distances, even if several nodes share the same minimum genetic distance). Note that we have used the command set.seed(9) to set a random number seed. Because there is some stochasticity in the presentation of a MSN, this is required to reproduce the exact same plot. In practice, you should explore using different seeds to obtain different representations of the same data. The plot is similar to the tree we rendered above and shows that the populations are not fully differentiated geographically. 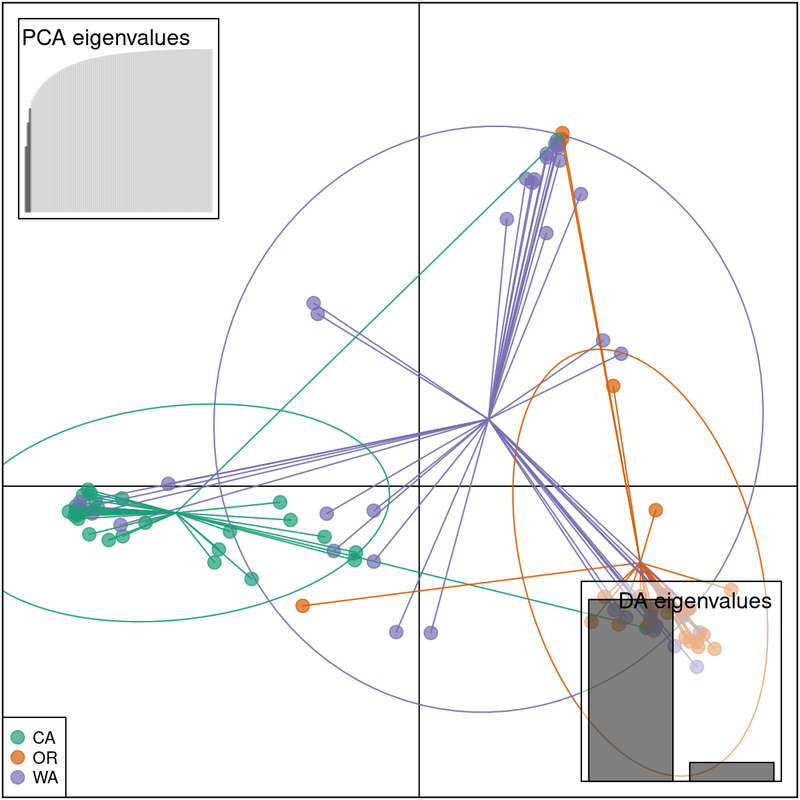 There are two main groups in the plot, one that clusters the OR samples with some WA samples (upper left), and a second that clusters the CA samples with some WA samples (lower right). This provides additional evidence for the two clusters observed in the genetic distance tree. Next, we perform a principal components analysis. A principal components analysis (PCA) converts the observed SNP data into a set of values of linearly uncorrelated variables called principal components that summarize the variation between samples. We can perform a PCA on our genlight object by using the glPCA function. The barplot indicates that we will need to only retain the first 3 PCAs, which cumulatively explain explain 63.183 percent of the variance of the data. To view the results of the PCA we can use the package ggplot2. We need to convert the data frame that contains the principal components (rubi.pca$scores) into the new object rubi.pca.scores. In addition, we will add the population values as a new column in our rubi.pca.scores object, in order to be able to color samples by population. The PCA produces a pattern similar our previous results. We observe that PC1 distinguishes samples from WA and OR, (right) from a cluster predominantly made up of CA and WA samples (left). The CA samples form a tight cluster with a narrow ellipse in green. We can further explore population assignments using a discriminant analysis of principal components (DAPC). The DAPC is a multivariate statistical approach that uses populations defined a priori to maximize the variance among populations in the sample by partitioning it into between-population and within-population components. DAPC thus maximizes the discrimination between groups. DAPC is explained in depth in the DAPC chapter on Part II of this tutorial and in the DAPC adegenet vignette. DAPC requires a genlight object with populations defined a priori. We already have this genlight object from the above steps. Usually, we use the number of principal components and discriminant axes that maximize the variance between populations; but our objective here is to calculate the population assignments based on the results of the PCA. We will use the same parameters as in the PCA to make the results comparable between both methods. These parameters (n.pca=3 and n.da=2) will be used to reconstruct the DAPC, obtain the assignment of the samples to each population, and suggest admixture between geographical states in the western USA. To confirm that the DAPC is similar to the PCA we can plot the data in a scatter plot. We see that the results of the PCA and DAPC are very similar. The DAPC object we created includes the population membership probability for each sample to each of the predetermined populations. 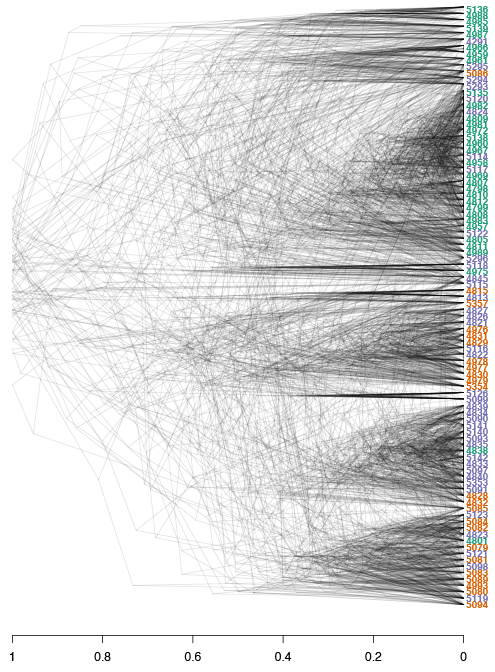 To visualize the posterior assignments of each sample, we use a composite stacked bar plot (compoplot). A compoplot illustrates the probability of population membership on the y-axis. Each sample is a bin on the x-axis, and the assigned probability of population membership is shown as a stacked bar chart with clusters or populations shown in color. These plots are hard to interpret and we will thus separate the samples by population. ggplot2 can be used to reconstruct these plots, but we need to convert the data into a ggplot2 friendly object. We will extract the DAPC calculated population membership assignments (pnw.dapc$posterior) into a new data frame (dapc.results), include the original population assignment as a new column in the data frame (dapc.results$pop), and add a column that includes the sample names (dapc.results$indNames). ggplot2 has specific requirements for the structure of the data frame format, as it requires each observation in rows, and all different values of these observations in columns (i.e., a long format data frame). To transform the data frame we use the function melt from the package reshape2. melt reorganizes the data frame into the required data frame format, where each membership probability observation for a given population is a row with the sample name, original population, and assigned population as columns. This bar plot shows us a more organized perspective of our data set by contrasting the population membership probability assignments against their original populations. In general, the composite plot shows that all western states of the USA exhibit admixture with other states, with WA showing the most admixture. One of the main limitations encountered when performing a population genetic analysis using large SNP data sets is the size of the data set. Large datasets require large amounts of computing resources, presenting a challenge to individuals who are not familiar with managing their computing resources. These large data sets are becoming very common thanks to the current developments on genomics and computational biology, where instead on performing analyses on one or a few loci current analyses focus in entire genomes of large populations. GBS data sets are good examples of large data sets used in population genetics. The large number of samples, and the high number of variants obtained, can generate gigabytes of data that are difficult to analyse with a desktop computer. Many of the variants obtained from GBS analyses are removed via filtering (for a deeper explanation of filtering genomic variant data review the quality control chapter of this workshop). Nonetheless, these filtered data sets may have hundreds to thousands of variants, making their analysis very tedious for the average user. One way of solving the issues of dealing with large genomic data sets is to subset the data set to smaller groups of random variants across the genome. Multiple subsets of a data set can be analysed in order to determine if the different subsets reveal similar overall results. These independent analyses will provide support to the results, while reducing the effective computational time of the analysis. We will illustrate the process of subsetting datasets using the P. rubi GBS data. As a reminder, this dataset has 138 samples spanning 615 variants across the genome. The number of variants in this analysis does not reflect a real large data set, but we will use it as it will allow us to compare the results of the subsets against the total analysis. This comparison will demonstrate that subsets of large data sets can provide information that is similar to the total data set while reducing the computational intensity of the calculations. We can see that the second object only has 10 variants. If we look at the summary in detail, we observe that the original sample has 312 chromosomes/scaffolds, 615 variants and a size of 2.9 Mb. The subset object, on the other hand, only has 4 chromosomes/scaffolds, 10 variants and a size of 0.9 Mb. Both objects have the same number of samples. This is a good example of how to subset a vcfR object. However, we want to obtain a subset of 200 random variants. If we do rubi.VCF[c(1:200)] we will only obtain the first 200 variants. These 200 variants will always be the same, and we will have no real replication to determine the strength of our approach. We have to check that the subsets are not identical. We can confirm this by using the function identical(). We can see that the vectors have different numbers. The results from identical() do not mean that every number in the vector is different. It just means that some of the values in the vectors are different, but each vector can also share some numbers with the other vector. When the two rubi.VCF.sub objects are compared we can see that the number of variants (200) and the number of samples (94) are identical. This indicates that the subset was performed correctly. Observe that the chromosome number and percentage of missing data are different. These different numbers show that each subset has selected different variants. Now we can generate subsets of random variants. We will extend the subset example by creating 50 subsets of 200 variants each, then we will then reconstruct a UPGMA distance tree per subset and overlay all of the reconstructed trees. This tree overlay will allow us to determine if the subsets support our hypothesis of low population differentiation, or if we have unique tree clusters for different subsets. You, the user, don’t have to execute this example, as it is for illustrative purposes only. # Creating a list object to save our subsets in. # Using a for loop to generate 50 subsets of 200 random variants from the rubi.VCF vcfR object. The densiTree reconstruction shows a very similar overall topology to the initial consensus tree: We see 6/7 major clades, and each of the clades is comprised of samples from different populations, indicating low geographic population structure. Furthermore, we observe how multiple subsets can result in similar patterns to the overall data. Subsetting large genomic variants is an easy, time-efficient and computationally smart method. We were able to determine that the western states of P. rubi do not have population structure based on geographical locations. The results showed that the CA population was less diverse and had a lower degree of admixture than either the WA or OR populations. 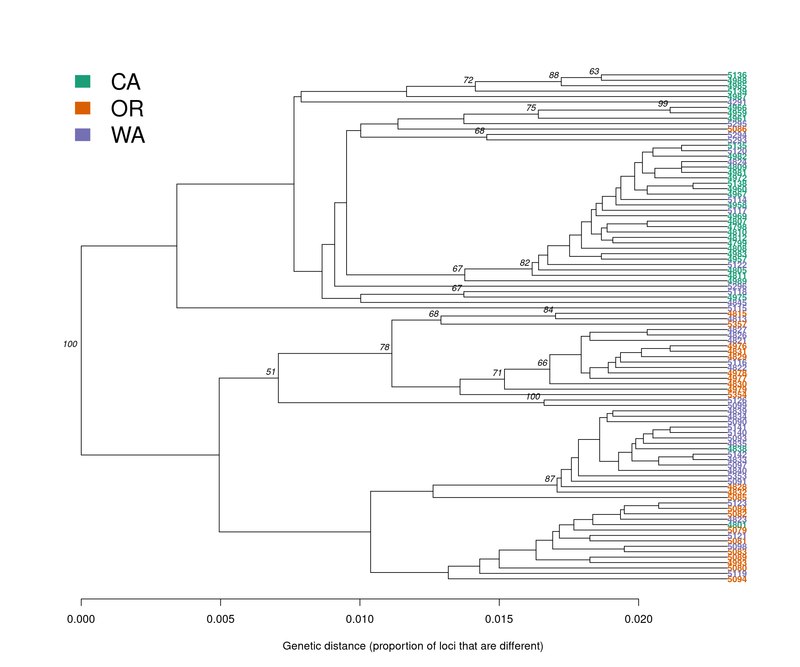 We can conclude that the geographical locations do not reflect the population structure of samples of P. rubi in the western USA, where the results suggested that different states shared genotypes across the entire geographic gradient resulting in one, panmictic and admixed population of P. rubi. 1) We frequently subset our data for various reasons. How could we go about subsetting our vcfR object to the isolates from California and Oregon. 2) Can you also subset the genind object? 3) Can you perform PCA on these two populations? 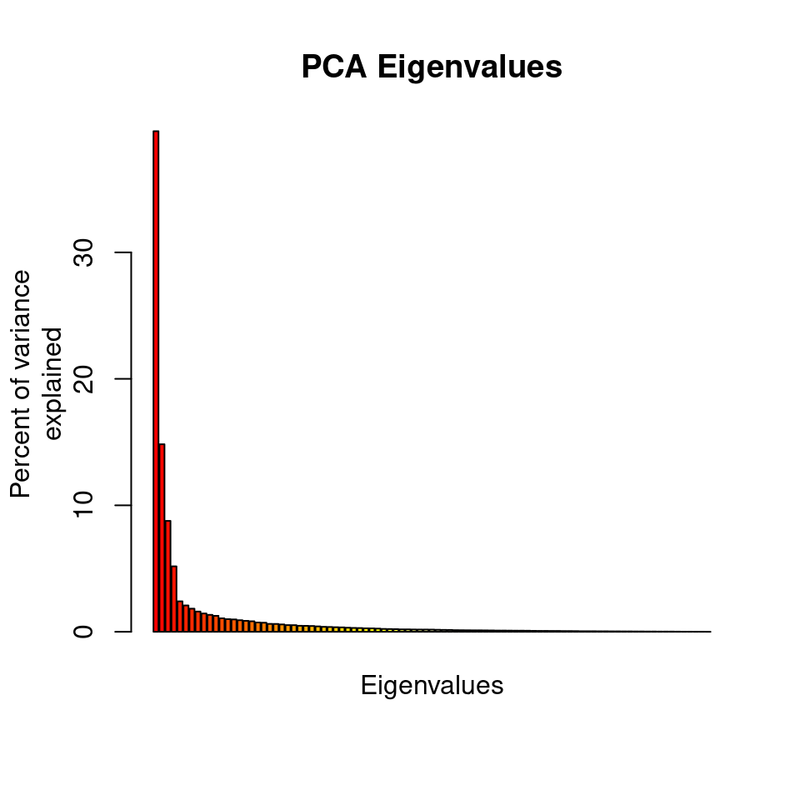 4) Can you plot the PCA? How important is the Washington isolates in our understanding of West coast Phytophthora rubi populations?